I've added an integrated Daily Journal to my Eventloggers.com "whole life logging" solution and I'd love to learn what features would appeal to the QS crowd. I'm using it to capture all the "difficult to quantify" stuff that I can't easily do with my existing tool-set. What I'm thinking about, how I'm feeling, interesting dreams, random thoughts, etc. I'm also using it as a diary/journal. If anyone is looking for a digital diary/journal solution, please try it out and let me know your thoughts. It's the "Journal" tab in Eventloggers.com - it's all free and private. Start a new journal entry without leaving the journal. If you're doing daily Event Logging, the events are integrated with your journal in this view. You can do a "full edit" on any entry, including adding/changing tags, photos, related links and of course the text. 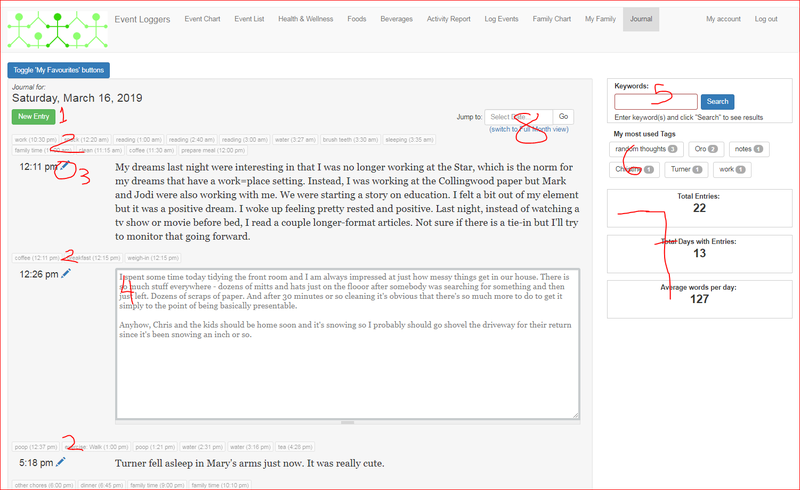 You can do quick inline edits by hovering over an existing entry. Just move the cursor out of the edit box to save your updates. Your journal is full-text searchable. You can tag each entry with keywords. They're listed here ordered by most popular on down. Basic stats are calculated on the fly. I'm interested in adding more, such as Reading Level and Emotional/Sentiment analysis. I wonder how important an encryption feature would be? Or the ability to add markup directly to the text? Other features? Hi Dean - I'm interested in trying this out but I try to be pretty strict about leaking personal data onto the Internet. I see that your basic approach is to respect privacy and personal control of data but when I review the terms I don't see this explicitly described. My sense is that you aren't monetizing personal data through sale to 3rd parties. Would you consider putting something more binding into your TOS? A recently published paper in the British Medical Journal by Quinn Grundy and five co-authors showed how health apps stealthily abuse users' privacy by delivering sensitive personal data to third parties. It's a very interesting study to read carefully, because it shows how the big tech players who supply data processing and cloud services to app developers also aggregate the benefit of leaked user data, since these third parties can use seemingly anonymous data like device IDs for re-identification and ad targeting. The authors used some clever methods to analyze data leaks, taking advantage of an open source research tool I'd never heard of before, called Agrigento. You own all of your own Event and Journal data. As a Member of the website, you agree to license your data so that we may use it in non-identifying ways to deliver useful information to you and to other Members and visitors of the website. If you choose to not be a Member any more, your Journal entries will be removed and you will have the choice of removing all your Event data completely or having it anonymized so it can continue to contribute. Who has access to my Event and Journal data? Your Event and Journal data is private not shared with any third parties by Event Loggers. If you use Google Home to send data to EventLoggers, Google does record and store your commands. You can review and remove what Google has stored at https://myactivity.google.com/myactivity. Google also offers a comprehensive overview of what it does with the voice data it stores on this page. Additionally, when you enter data via your computer or phone browser, the data is encrypted via https on its journey from your device to the server. Who has access to my site visitation data? We use Google Analytics to measure traffic to the website. When you visit a page on EventLoggers.com, a script supplied by Google called a "Tracking Code" collects information about the page you're visiting, the time, your publicly visible IP address and other visitation information. Your IP address is stripped out by Google and not included in any reports. Google provides a good overview of what it collects via the Google Analytics Tracking Code here. We do not share your site visitation data with any other third parties. Thanks again for the feedback Gary. I really do want to create a service for regular people to easily document their days and give them tools to explore and use their data without handing it over or passing it through to disinterested third-party aggregators who have other objectives - like selling people something or adding anyone to a mailing list. Ensuring that they are comfortable with how their data will - and won't - be used is an important step that I probably took a bit for granted.